James Woolway: James Woolway is Sales Director of OPICO Limited, UK distributors for a number of different American and European machinery manufacturers. OPICO Limited was started nearly 40 years ago by Jeremy Coleclough and over that period have been involved in establishing several new technologies in UK agricultural machinery - most recently importing the Danish HE-VA range of cultivation and crop establishment products. James was brought up on a mixed arable, pig and sheep farm in Cambridgeshire before attending Silsoe college to take a degree in Agricultural Technology and Management. 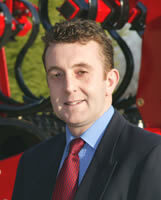 Since Silsoe James has worked with a number of machinery companies specializing in crop establishment techniques and cultivations.